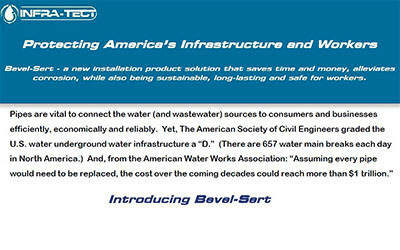 Infra-Tect provides innovative corrosion mitigation solutions to water and wastewater infrastructure piping systems with its patented Bevel-Sert. It delivers a lower cost of installation, operations, maintenance and repair and improves ductile iron pipe water infrastructure’s three pain points in this industry: 1) money and time spent on installation; 2) corrosion damage and; 3) worker safety. 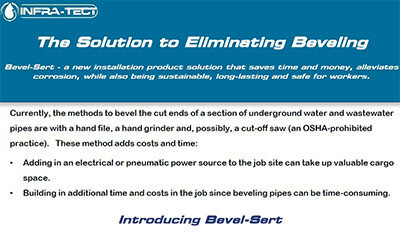 Learn how Bevel-Sert provides for lower costs, worker safety and corrosion mitigation.